The independent bookstore has never stopped doing its best to breathe underwater. 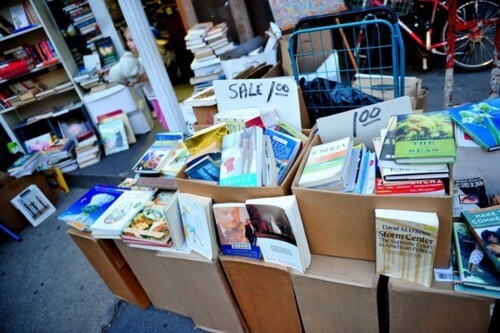 From the encroachment of computers and the Internet to the big box chains and their tack sticker discounts to Amazon and their even steeper, virtual tack sticker discounts to the e-book explosion that has us skipping both stores and ink, independent retailers have long been cursed with having to roll with the punches. You either roll, or you roll out. It has never been an easy business and so what many of these bookstores have done, and will do, is look to diversify their stock so that additional profits can be earned (see: the postcards, the pens, the t-shirts, the toys). They will host (and now charge for) author readings, book launches, book club meetings, and story-telling events – with hopes that the store will start to feel like an extension of our home – that other room we feel like being in now. They will constantly be thinking of ways to reinvent themselves, innovate and keep up. 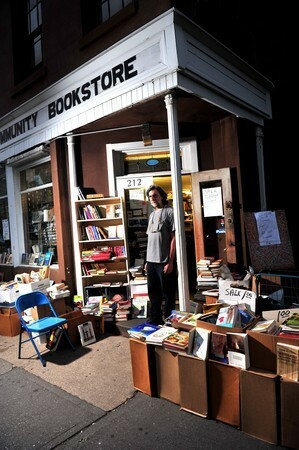 The Community Bookstore is a Cobble Hill mainstay. Its doors have been open - literally, even in wintertime - at its Court Street location since 1985. It is a beautiful (and maddening) new and used mess of what it means to be a freak for the printed word. It is also the perfect place to go off and lose your mind in, and one day I know I’ll find the book that gets pulled from the shelf to reveal the portal to another dimension. The store’s space (an oxymoron in its own right) is warm and dim and dusty and tight like an old attic you’d rather not crawl through to find something in, even though you know perfectly well that what you’re looking for is there. We throw out our sensitivity to clutter when we are here; we do our best to save the compulsive need to see things clean and organized for home. Also, no sudden movements - you might knock down a book tower. While other bookstores’ aisles allow for popping squats on the floor, Community’s aisles just seem to impede on the storage for more and more books. It’s almost as if the negative space is more of the encumbrance, rather than what’s filling it. Only one madman can run this store and that man is John Scioli. Scioli was raised an only child in an apartment on Spring and Mulberry streets in Little Italy. His mother was a homemaker; his father worked in a chromium-plating factory. 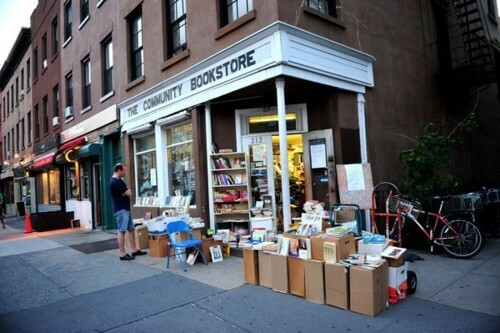 There may be truth to that statement, but it didn’t stop John and his wife from crossing the bridge and opening up a small bookstore on 7th Avenue in Park Slope that they aptly named The Community Bookstore. (“Better than calling it Book Nook, right?” he jokes.) The year was 1971. Middle-income hippies were buying majestic brownstones they could renovate with two hands while knives were cutting tensions between Latino and Italian communities. Park Slope was on the cusp of gentrification. The store did well, and three years later, they opened up a second location in Brooklyn Heights on Montague Street. During that time, however, John and his wife divorced. She took the Slope; he took the Heights. He was there for eleven years until the fateful day when an ice cream chain rode up and offered his landlord triple the amount he was paying in rent. The neighborhood petitioned and wrote letters, but in the end ice cream won. John scrambled to find a new space, and in 1985, he purchased the corner building on Warren and Court streets, making himself at home on the top two floors. The corner may not be as raucous as it once was, but it certainly gets its share of foot traffic and stroller wheels. John can often be seen outside futzing with his books, smoking cigarettes and chatting with his customers and neighbors. He stops our conversation to say “Buona sera” to the elder Italian man who walks slowly with groceries. Truth is, John doesn’t have to do it at all; he could retire. In fact, every year he gets to pretend that he’s retired. For the months of August and September, he will close the store and fly to the south of France to visit his stepson and then to Russia to see some friends. That may sound grumpy but John does feel the neighborhood needs a place like Community. In a rapidly changing area, any remnants of the familiar are likely to play a part in the preservation of nostalgia. Or maybe, in a neighborhood that keeps getting pricier and pricier, we just love seeing things that could potentially cost us a buck. Despite the accumulation of books and things (and paper coffee cups), John can tell you off the top of his head if he’s got a specific title in stock. Computer? Who needs a computer? “This is, like, what I do, you know?” he says, shrugging it off. “I bet people go into Barnes & Noble and ask for Old Man and the Sea and the salespeople have to ask them who wrote it so they can look it up. Those people don’t have a clue,” he said.